(17/P84) TRENTON – Seeking to minimize health risks for people and animals, the Department of Environmental Protection (DEP) has developed a strategy for a unified statewide approach in responding to incidents of Harmful Algal Blooms (HABs) in freshwater bodies across the state. 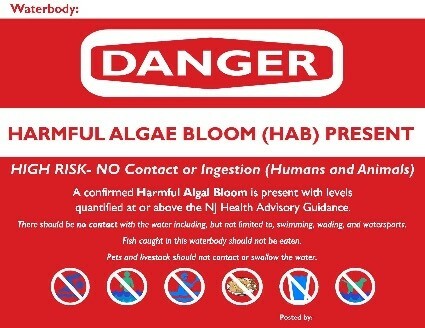 Under the new Avoid It and Report It effort, anyone who sees a suspected bloom resulting from cyanobacteria may contact DEP through its toll-free hotline or the WARN NJDEP app for smartphones and tablets. In addition, a new HAB website has been launched to coordinate important information and response activities. Alerting DEP to the suspected blooms quickly can help protect public and animal health and freshwater resources. 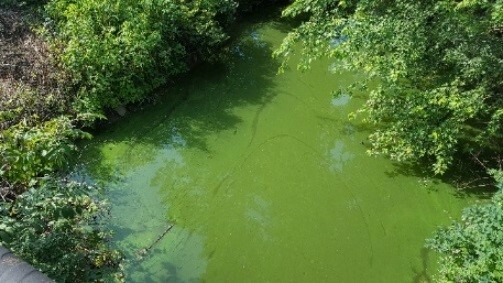 “Expanding our ability to respond to Harmful Algal Blooms, establishing preparedness procedures, and making information about these blooms more readily available to the public enables DEP and its partners to better protect the health of those who use New Jersey’s lakes and streams for recreation,” said Dan Kennedy, Assistant Commissioner for Water Resources Management. Most algal blooms observed in New Jersey’s waterways are harmless and are not cyanobacteria. They result from too many nutrients causing excessive blooms of naturally present algae. Cyanobacteria, also known as blue-green algae are usually a bright green, but can also appear as spilled paint, “pea soup,” or as having a thick coating or “mat” on the surface. They can often be confused for typical algae blooms. Cyanobacteria are also naturally present in lakes and streams in low numbers. Under suitable environmental conditions – sunlight, high nutrients, warm temperatures and calm water – dense cyanobacterial blooms can form. Cyanobacterial blooms do not always produce toxins, but when they do the blooms can pose a risk to people, pets, livestock and wildlife if exposure occurs by ingestion, inhalation of contaminated water, or dermal contact. Rashes can occur when cyanobacteria cells come in contact with skin. Report a suspected HAB by calling the DEP Hotline at 1-877-WARNDEP (927-6337) or send a mobile alert through the WARN NJDEP mobile app (available via iTunes, Google Play or Windows Phone). The new response strategy, developed jointly by the DEP and the state Department of Health (DOH), with technical input from the state Department of Agriculture, protects the public from risks associated with exposure to cyanobacteria and related toxins. While the primary focus of the strategy is protection of human health, it also provides information on how to prevent exposure to domestic animals and livestock. The New Jersey Water Monitoring Council and the U.S. Environmental Protection Agency’s Office of Water provided technical input and review of New Jersey’s HABs strategy. The response strategy covers freshwater lakes, rivers, and streams with potential public access, recreational use, and bathing beaches (including licensed beaches). While these waterbodies may also be sources of drinking water in New Jersey, the focus of the response strategy is recreational use. DEP works closely with drinking water systems to plan for HABs as well as all other drinking water emergencies. A process for developing a HAB research plan. Based on information from the U.S. Geological Survey, 19 states had public health advisories for cyanobacterial blooms in August 2016. With the release of the new response strategy, New Jersey joins more than 30 other states who have developed HAB strategies and/or HAB public awareness informational materials. So far this summer, New Jersey has responded to nine confirmed or suspected HABs in lakes and streams. The new NJDEP HAB-focused website, at www.state.nj.us/dep/wms/HABS.html, contains information on both freshwater cyanobacterial HABs, and a variety of marine water HABs. Highlights include an electronic cyanobacterial HAB Reporting Form, downloadable Advisory signs and flyers for use for HAB events, a general cyanobacterial fact sheet, and a more detailed fact sheet on recreational exposure and health effects related to cyanobacterial HABs. General information about cyanobacterial HABs, what to do if people or pets are exposed, links to the EPA and U.S. Centers for Disease Control’s HABs websites and other resources, as well as a gallery of both HAB and non-HAB photos of lakes and streams, are also provided.